Today's Draw: King of Wands from the Art of Life Tarot. Are you struggling with an interpersonal issue lately? Have you been betrayed by someone close to you? Do you feel alone in all of this? In the past couple of months, I've had a few people I consider to be friends lie about me, lie to me and bait and switch on me for their own gain. Different people. Different situations. But a lot of disappointment and surprise. Looking back, there were clues, I suppose. But sometimes the clues are so subtle and easy to ignore that it just seems like the conflicts were necessary. Each of these situations has left me feeling humiliated in different ways. I've mentioned on this blog many times before that I am not a vengeful person. So if you're not going to get revenge, basically all that's left is to swallow your pride and move on, despite feeling embarrassed, hurt, bullied, etc. Many years ago, I was subject to significant online bullying. While it never got this bad for me, I see why some people commit suicide over stuff like that. A person with integrity stands up for themselves, but never sinks to the level of their attacker. That's what I believe. So if someone is conspiring against you, you don't conspire back. Unless you're a conspiratorial kind of person. So you have to make a choice—hit them back with everything you've got or maintain true to the person you are. It's very hard to maintain your ethics and beliefs about how to treat others when you're being treated horribly. Feeling bullied and alone and knowing others are talking badly about you can lead you to some very dark places within. Sometimes I struggle with whether or not it's ok to let the assholes win in order to remain true to yourself. I've been struggling a lot the last couple of months. It's hard to keep believing you're doing the right thing by letting go. 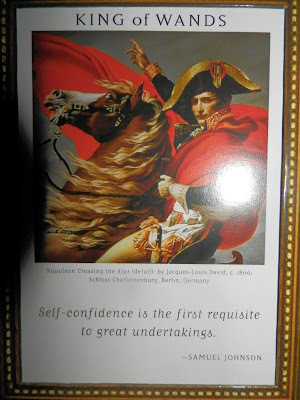 Anyway, today's card affirms that self confidence is key to great undertakings. And that's what we've got going here with our spiritual and personal growth—a great undertaking. There are times that it's hard to remember that the things people say and do to you are more about themselves. There are times it's hard to trust that the universe is acting in your best interests. There are times it's hard to hold on to what's true with all the subterfuge around you. And there are times it's hard to rely on karma to make things right. I don't think anyone ever achieves unshakable self confidence. But I do think you build it stronger by moving forward with integrity...believing in yourself and being true to that, regardless of outside pressures or impressions. Looking back on the online bullying from a decade ago, I can see so many benefits of resisting the urge to give them a dose of their own medicine. For one, people THAT effed up have stopped showing up in my life. That alone is enough. While it's still too close for me to see with my current situations, I do see the desperation that is the common thread among them. The humiliation I feel in these situations is a temporary thing. Desperation and a lack of self-awareness are more lingering. So I'm glad to be on this side of the issue. And I'm glad to have the wisdom to see the aspects that are being mirrored back to me and the places that need to be healed. Everything else is just noise that, if I listen to it, can keep me from moving forward. I am so sorry that you were treated badly by people you trusted, that is a terrible feeling. I think King of Wands also has the gift of being able to shake things off, resilience and moving forward toward the next project, challenge or good friend without overly ruminating on a hurtful past is such a wonderful Wands trait. Thank you, Jenna. :) You make excellent points about the King of Wands. I'm trying to shake things off. The older I get, the better I get at that, but I do still have a tendency to linger some.